A former Colome resident, A. J. Armstrong, was one of the soldiers of the South Dakota Army National Guard’s 200th Engineer Co., who will depart for a nine-month assignment in the Middle East. Armstrong is the son of Alan and Diane Armstrong of Colome and is a graduate of Colome High School. The 31-year-old Armstrong, who has served 12 years in the National Guard, will leave behind his wife and four kids. A story on Armstrong was featured in Saturday’s Mitchell Daily Republic. The guard unit’s assignment in Kuwait will be to help assemble, maintain, repair and replace standard U.S. bridging systems. 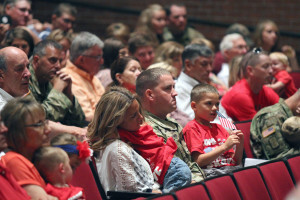 A deployment ceremony was held Saturday in Pierre with Gov. Dennis Daugaard speaking. Serving as a first lieutenant and the group’s executive officer, Armstrong was one of many soldiers who volunteered for the deployment and will be in charge of training the team for bridge building. In 2016, Armstrong was recognized by the South Dakota National Guard as the lieutenant of the year. “We are looking forward to going over there,” said Armstrong.